This release focusses on extending the capabilities to support running with multiple exposures, improving reporting functionality and of course fixing bugs and improving the robustness of the outputs produced by InaSAFE. This release adds a new tool which allows you to prepare and run a scenario with one hazard and two or more exposure datasets of different exposure types. This is a stop towards being able to use the same code base for producing reports in InaSAFE realtime and InaSAFE desktop. You can find this as a new tool in the InaSAFE toolbar. The tool lets you select one hazard, one aggregation area and two or more exposure layers. When the tool runs it will create a layer group in the QGIS layers panel, with subgroups for each hazard - exposure scenario. These are standard InaSAFE output folders. In addition, it will create new products in the top level layer group that contain an aggregation of all the impact summaries into a single table. You can specify a report template to use and generate a customised multi-exposure support, similar to those produced on InaSAFE realtime - or something specific to your organisation's needs. Note: InaSAFE does not ship with any multi-exposure specific templates - we expect that power users will use this feature to create their own templates. InaSAFE 4.3 introduces a new first run wizard. We added this to draw user's attention to critical parameters in InaSAFE that will affect the reports produced by InaSAFE. In this wizard, you can configure organisation name, logo etc. Additionally, you can specify displacement rates for each hazard class, and whether each hazard class affects population or not. We want to make it easy for users to customise these rates for their local environment and not 'blindly' use the defaults that InaSAFE provides. The options in the first run wizard can also be managed from the general InaSAFE options dialog (available in Plugins -> InaSAFE -> Options). In some production environments, InaSAFE 3.5 is still being used. We added a tool in 4.3 (which has also been backported to 4.2) which will allow you to create 'old' keywords metadata so that you can upload datasets to GeoSAFE and InaSAFE Realtime and have the keywords recognised properly. We will remove this tool again at some point when InaSAFE Realtime and GeoSAFE have been upgraded to support InaSAFE 4.3. The shakemap importer tool will now do extra steps in the desktop to add new InaSAFE keywords to imported shakemap datasets that include the epicentre, time, event-id etc. for the earthquake. The importer now also provides options for smoothing the MMI grid after importing - this is intended for report production - we recommend using 'no smoothing' when using the imported grid for analysis. A detailed list of expressions and how they can be used can be found at in the online manual for InaSAFE. These keywords are automatically if you use the shakemap converter in InaSAFE and are visible in the keywords viewer in the InaSAFE dock. They can also be accessed via expressions for use in reports. use an override template - this automatically replaces the standard template if the report name follows the convention: <hazard>-<exposure>.qpt. These override templates should be placed in your <home directory>/.qgis2/inasafe/ folder. use a specific template from the standard search directory (<home directory>/.qgis2/inasafe/). Pressing the print button will now show a small dialog where you can choose a base template and then open the report as a PDF. Due to some architectural changes, InaSAFE 4.0 lost the ability to edit the map report template before printing. InaSAFE 4.3 fixes this. The map-based reports will be produced as a template that you can either open and edit, then print from the composer, or printed directly to PDF. InaSAFE 4.3 fixes a critical bug where report outputs may have been incorrect when a hazard had a class of zero. InaSAFE 4.3 also includes a host of additional bug fixes and improvements. You can view a filtered list of the closed issues here. A new pre-processor on InaSAFE desktop will generate smoothed MMI contours automatically as a by-product of the analysis process. These can be used as part of the report production process for earthquake-based analyses and are part of our efforts to rationalise the code bases between InaSAFE realtime and InaSAFE desktop. InaSAFE 4.3 adds support for dam break hazard analysis. This kind of hazard also describes an inundation classification divided into 3 areas of inundation classified based on water level above ground surface. It is now possible to assign populations to places and carry out an analysis of affected places with populations included in the report. This is useful when, for example, generating an earthquake impact report you can now show affected places on their populations. InaSAFE 4.3 will now use the aggregation coordinate reference system (CRS) instead of exposure CRS. 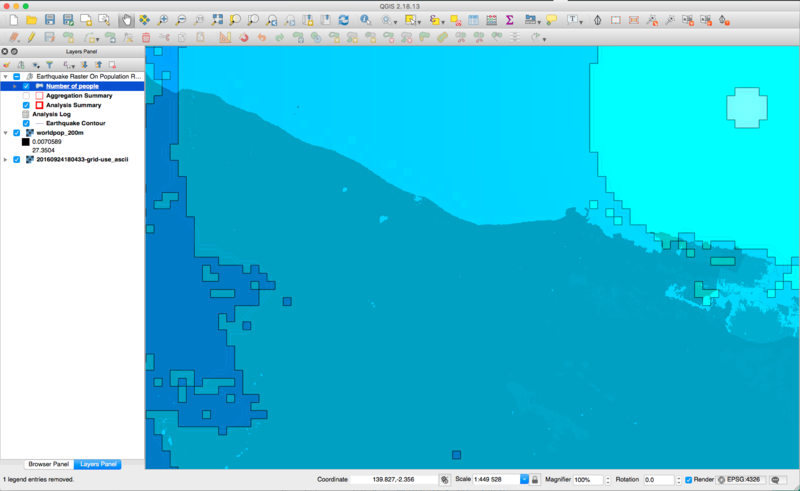 If no aggregation layer is provided, the map canvas CRS will be used for analysis.